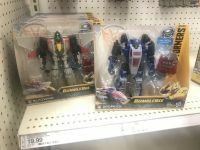 Courtesy of 2005 Boards member Blurple Haze in our Texas Transformers Sightings Forum, we can report that the Transformers Energon Igniters Nitro Series Blitzwing And Dropkick have been found At US Retail. These Nitro Series toys are bigger and more articulated versions of the Decepticon villains for the Energon Igniters line. Both of them were spotted at Target in Lewisville, Texas for $19.99 each one. For those interested, here's a video review for Blitzwing. It's in German, but you can clearly see what's going on. Didn't find one for Nitro series Dropkick. I would like to see a movie accurate Soundwave… He really looked incredible! Ugh. That sounds like something you would put acne or something. Anyone bought these? Would love to see more pictures and descriptions of how they work. This Dropkick could make nice Rotorstorm. I quite like this dropkick but I\'m really not liking Blitzwing at all . Say what you want about SS Dropkick… but at least he has knees. The colors on Dropkick are giving me a G1 Euro vibe. How's kicks, Rotorstorm? Can somebody help me out with Blitzwing? All times are GMT -4. The time now is 8:03 AM.